The much awaited $35 cheapest Indian tablet pc is finally a reality. Aakash tablet– is world’s cheapest Android powered tablet pc. Yesterday Kapil Sibal, Union Minister for Human Resourced Development announced this world’s cheapest tablet pc- Aakash (means Sky in Hindi). This affordable tablet pc will cost Rs 2,999 ($60) in retail stores. Students can get this tablet for Rs 1,700 ($35). The $60 tablet PC will have built-in SIM card slot for GSM and 3G connectivity options along with Wi-Fi. The $35 version will not have GSM/3G capability, only Wi-Fi will be present for internet connectivity. This cheapest tablet computer is manufactured by DataWind. This low-cost Android tablet’s brand name is UBSLATE but it will be sold as aakash tablet in India. Aaaksh tablet runs Android v2.2 Froyo and has Conexant 336Mhz processor with accelerated HD graphics for playing HD quality videos. There is 256MB RAM and 2GB internal memory. Further memory expansion is possible through MicroSD card slot which supports 32GB MicroSD cards. This tablet has 7″ touch screen with 800×480 pixels resolutions. There are two USB 2.0 ports for connecting more devices with this world’s cheapest tablet. It is now released in India and available in online store. How to Buy Aakash Tablet? Aakash Tablet is now available for purchase. You can buy it now by visiting their official website http://aakashtablet.com and filling the order now form. At this time aakash tablet is available only in online, it is not available in stores. After booking the Tablet PC it may take around one week time to deliver. Cash on delivery option is present, so no need to worry. There is an updated version of Aakash Tablet is coming in late January 2012. This is called UbiSlate 7 and it will have much better hardware compared to Aaksh tablet. 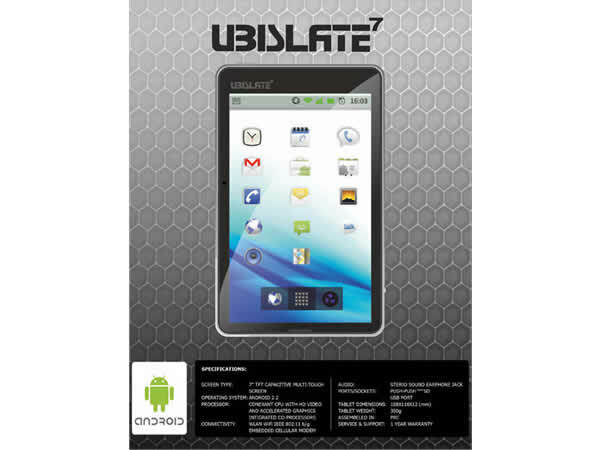 UbiSlate 7 uses faster ARM Cortex A8 processor running at 700 Mhz clock speed and it will run latest Android 2.3 Gingerbread. UbiSlate 7 will have bigger battery of 3200 mAh capacity and it will have both Wi-Fi and GPRS connectivity options. You can use regular SIM cards for calling facility. UbiSlate 7 will cost Rs 2,999 ($60) which is Rs 500 more expensive than Aakash tablet. Have you booked Aakash tablet ? or you will wait for Ubislate 7 ? Thanks Plaban for this wonderful article. Hope that now in India, every student will be having good knowledge of computer and technology. its extremely delighting to have a tablet with such a low price. Indian students need such things to upgrade oneself in technology. Thanks so much.